API Power Without API Complexity! Receiving messages from an active jobs job log can be helpful for simple tasks, such as monitoring batch jobs, or complex tasks, such as creating automatic recovery applications. IBM has provided an API, QMHLJOBL, that retrieves job log messages, but, like most APIs, its messy. Vadim Rozen wrote an RPG IV procedure that provides a much better interface to the QMHLJOBL API. His procedure, Receive Job Log Messages (RCVJLMSG), takes care of all the gory details, such as creating user spaces, setting parameters to arcane values, and interpreting errors. Figure 1 shows the five parameters that RCVJLMSG requires. For lack of space, the code for RCVJLMSG is not printed here. You can download it from the Midrange Computing Web site at www.midrangecomputing.com/mc/99/03. You will need to split the downloaded file into three members. The first is the procedure prototype for RCVJLMSG. Place this into a source member under a name of your choice. For example, you might place this in member RCVJLMSGP of a file called QRPGLESRC. This member also includes documentation for some of the parameters and RPG IV code for the data structure in which message information is returned. The second is the RCVJLMSG module itself. Using a source editor, such as SEU, change the /COPY directive to point to the member in which you placed the prototype. The third is a sample program I wrote that calls RCVJLMSG to print a job log. You can use this to become acquainted with RCVJLMSG, as I did, and as a basis for your own programs. RCVJLMSG returns information about messages through a data structure passed through the fourth parameter. RPG IV code for the data structure is shown in Figure 2. You can find more information about this data structure in the OS/400 Message Handling APIs reference manual. Youll find it described as the LJOB0100 format. I like very much what Vadim has done. Within minutes, I had a simple program reading my job log. If I had had to use QMHLJOBL instead, it would have taken much longer. Vadim has given us more than just a handy tool. Hes shown us how we can develop the tools that harness the power of APIs without requiring us to deal with the complexity of APIs. iJob 26A A left-adjusted asterisk (*) indicates the current job. For another job, enter the job name (10A), user profile (10A), and job number (6A). iAction 10A To retrieve the first message, specify *NEW; to retrieve rest of the messages, specify *CONTINUE. iDirection 1A The possible values are F (forward) and B (backward). The value F reads job log messages from the first one to the last. The value B reads messages from last to first. oMessage 1120A This parameter returns an 1,120-byte data structure containing the message and its attributes. oReturn 10A This parameter returns the status of the program. Blanks indicate that a message was retrieved successfully. *ERRO means an error occurred in the program, so no message is returned to the calling program. *OVERFLOW means the retrieved data length is greater than 1024 bytes. *ENDOFJLOG means no more messages found in the job log. Figure 1: RCVJLMSG requires only five parameters. Figure 2: Message information is returned in an easy-to-use data structure. Ted Holt is IT Manager of Manufacturing Systems Development for Day-Brite Capri Omega, a manufacture of lighting fixtures in Tupelo, Mississippi . He has worked in the information-processing industry since 1981 and is the author or co-author of seven books. MC Press books written by Ted Holt available now on the MC Press Bookstore. Why settle for just enough CL knowledge to get by when you can truly master this important language? All it takes is a little time, effort, and Complete CL. 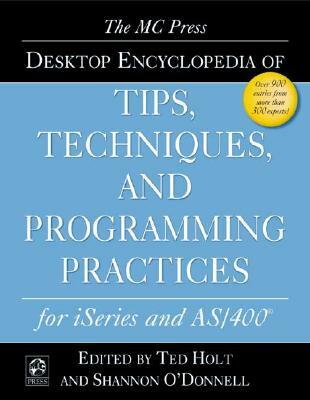 This comprehensive, 35-chapter book is the ultimate resource and a "must-have" for every professional working with the i5/iSeries. This highly readable, comprehensive new reference, compiled by IBM midrange authorities Ted Holt and Shannon O'Donnell, includes more than 900 entries by more than 300 experts from around the world. Ted Holt and IBMer Fred Kulack take you through Qshell and show you the ins and outs with more examples than you can imagine. 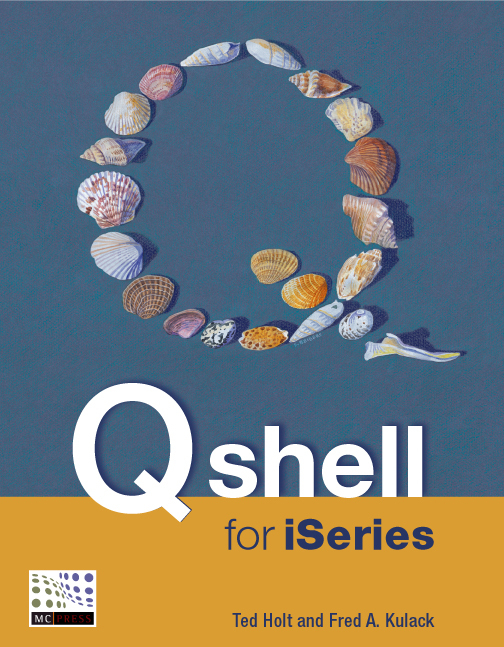 Find out why Qshell is one of the hottest new topics on iSeries.